Gun.Smoke is a vertical scrolling shooter arcade game designed by Yoshiki Okamoto, and created by Capcom in 1985. The game, which has an American Western theme, centers around a character named Billy Bob, a bounty hunter who is after vicious criminals of the Wild West. The game was also ported to the Famicom Disk System and NES in 1988, with some alterations. The objective is to free the town of Hicksville from the band of criminals known as the Wingates. In order to capture their most dangerous henchmen, in each stage the player must retrieve a Wanted sign of said henchman, otherwise it is impossible to clear the stage. 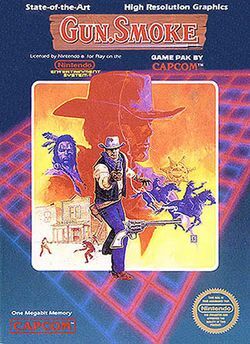 This version of Gun.Smoke was first released in Japan on the Famicom Disk System, and was soon followed by a version on the NES for both the American and European markets. The NES and FDS versions are virtually identical, but with some slight differences. Like most FDS games, there are loading times in between levels. There's also no player demonstration like in the NES version. The font in the FDS version was the traditional Capcom-font, as seen in most of their NES games, while the font in the NES version was the military-style, as seen in the Arcade version. For some reason, the words for the opening storyline "In 1849" was changed to "In America" for the NES version. The wanted posters for the outlaws originally had an Anime look, and Bandit Bill's shirt originally had an open collar. In the NES version, they were given a realistic look, and a scarf was added around Bandit Bill's neck. After you beat the game the first two times, there is a Japanese message that tells you to beat the game again. This was thrown out in the NES version. The most noteworthy difference in between the two versions is the music. It becomes evident as soon as you defeat Devil Hawk. Because of the limited memory on the disk cards, the level 1 theme is recycled in levels 4 and 6, the level 1 boss theme is recycled as the boss theme for levels 4 and 6, the level 2 theme is recycled in level 5, and the level 2 boss theme is recycled as the boss theme for level 5. Not long after the FDS was released, improvements were made to NES and FC cartridges. This gave Capcom the opportunity to add six new tracks for the game's soundtrack. This town, which was a bustling gold rush area several years ago, is now the target of bandits who kill mercilessly to steal gold dust from the people. The peace loving people donate their hard won gold to place a reward on the head of these bandits. At this time, Billy, a young man of only 21, stands up bravely to rescue the town. This page was last edited on 25 January 2012, at 15:50.